The program is easy for retailers and customers alike. The way it works is simple. If you have a website where customers can order your products, you provide a click-through interface that allows the customer to make a voluntary donation to F3 after totaling up their purchase. They have a choice of either rounding up their purchase price to the next whole dollar amount and donating the difference, or adding a whole dollar amount of their choosing by clicking on a button that shows that amount. Our partner, TTI-Blakemore Fishing Group, was the first to set up the program on their website (www.tticompanies.com). 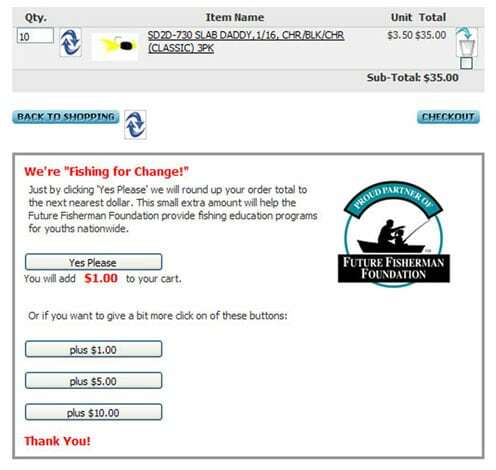 The following screen capture shows how the “Fishing for Change” interface appears to their customers when they check out. We will provide you a copy of F3’s Partner logo (see example above) to include with this text. When possible, we ask our partners to use their in-house or contracted IT staff to set up the “Fishing for Change” interface on their website as part of their donation to the program. If you prefer, we can provide contact information for a company that can set up the interface and a donation-tracking program or consult with your IT staff for a reasonable fee. When “Fishing for Change” is operational on your website, you simply keep track of the donations, and write a check to the Future Fisherman Foundation when a significant amount accumulates or a least once a quarter. Companies enrolled in similar programs elsewhere often add their own donation at this time, usually in the form of a matching gift. We believe web-order businesses that participate in “Fishing for Change” can generate significant contributions over the years. Using similar programs, some companies have collected truly significant sums (in some cases, millions of dollars) that benefit other non-profit organizations. Customers have been making donations through TTI-Blakemore’s website since the first day the “Fishing for Change” interface was active, a fact that shows people’s willingness to contribute when it is convenient and inexpensive. The expense incurred by companies participating in “Fishing for Change” is relatively small—basically just the cost of setting up the checkout/donation tracking interface on the company website and administering donations. Support comes primarily from customers who make voluntary donations in an amount of their choosing. What’s in it for you? We’ll tell the world about your support in our newsletter and special press releases, which regularly are sent to more than 4,000 partners, educators, writers and media outlets. Our website (www.futurefisherman.org) has a special “Partners” section, with links driving traffic to partner websites. We’ll include you there, and also talk about your support in our blog and on our Facebook page. We’ll also provide you a copy of our Partners logo (see example above) to use in your advertising, correspondence and invoices. Most of all, you’ll have the satisfaction of knowing your support is helping the Future Fisherman Foundation continue a 23-year tradition of delivering quality fishing education programs to children nationwide. Money donated through the “Fishing for Change” program will allow us to provide training and curriculum for educators who deliver our programs; to develop special events to share outdoor aquatic education with the public; and to expand our efforts to reach disadvantaged children who need positive activities and caring mentors in their lives. Funding will go directly toward providing valuable opportunities for children to learn how to fish and enjoy the outdoors. Our primary programs like “Hooked On Fishing Not On Drugs” have benefited more than 1 million children in all 50 states since 1986. Working together we can continue that tradition and ensure today’s kids are tomorrow’s anglers. That’s a goal worth striving for.